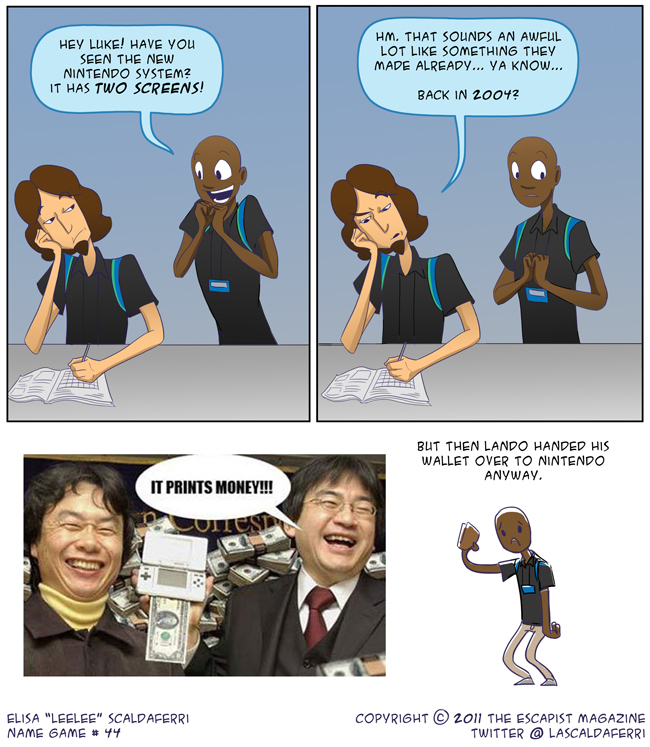 Whenever Nintendo releases a new system, I tend to go through the same motions. I immediately think it's dumb. Then it turns out to be incredible. Then I buy it for the same games. The DS? "Two screens? How will that ever work?" Organizational brilliance. The 3DS? "Nothing more than a headache for $250." Then I played Ocarina of Time on one at PAX. It's coming out next week? How much is in my bank account!? Nintendo knows how to cash in on my childhood (extremely well). Hell, the only reason I bought a Wii was for Brawl. If Twilight Princess was only on Wii and not Gamecube I would have bought one even earlier. The Wii U? I'm still not sure- oh wait new Smash Bros.? And it connects to the 3DS? And it might have HD Zelda? SIGH. And don't pretend you didn't choke up when Zelda's lullaby chimed into this beautiful work at E3. I KNOW I DID.